Summer means berries, berries & more berries. This Sunday when he got few packs of fresh blueberries, he told me to make blueberry muffins. 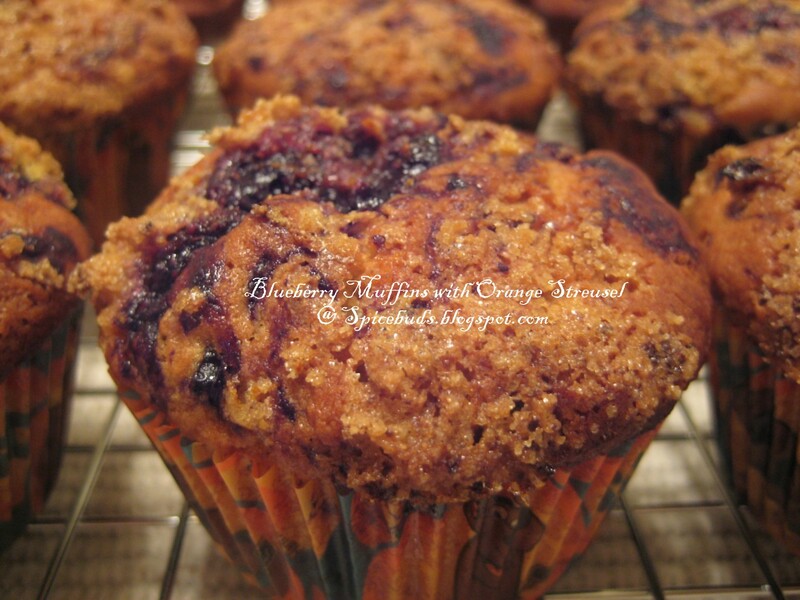 I have made these quite a few times & we all love these over the regular kind of blueberry muffins. First time when I ate these on one of our road trip I absolutely loved these....moist & nice crumb with lots of blueberry flavor & nice crunch on the top, to me it's perfect. I will prefer these over any other kind of muffins. I have used Orange zest for topping one can easily change it to lemon zest if they like, also if you wish store bought jam(chunkier kind) can be used but I really recommend sparing 10 minutes & making a small batch of jam. 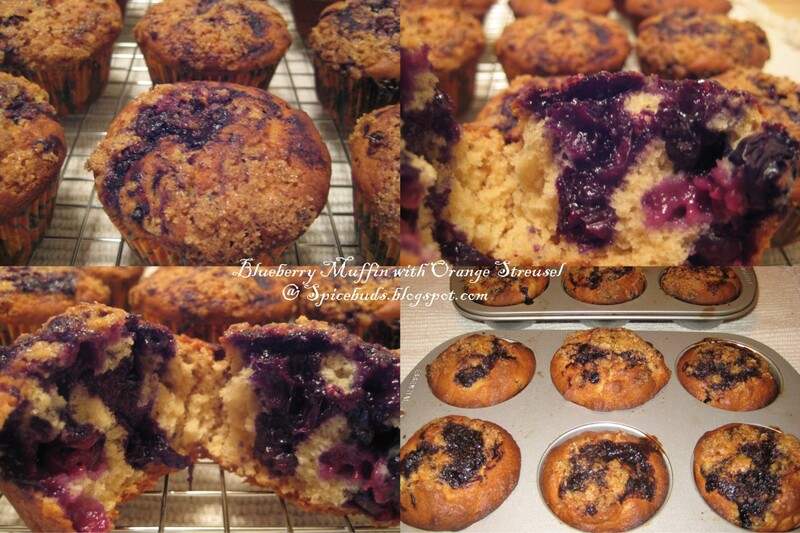 Recipe below is for 12 regular size muffins. Cook blueberries with sugar on med. heat for about 7-10 minutes till u get the jam like consistency. Mash the berries with the back side of the spoon. Use more or less sugar as per your taste & tartness of berries. Let it cool. 2. To make streusel topping mix sugar & zest, keep aside. Heat oven to 425 degree F. Prepare muffin tin with non-stick spray or line muffin tin with paper liners. In a large bowl whisk flour+baking powder+salt. In another bowl mix sugar with oil & melted butter. Add buttermilk & vanilla, whisk everything together. Now add wet mix to dry mix & gently mix everything, using a hand whisk. Batter will be thick & might have some lumps, BUT DO NOT OVER MIX. Using a spatula fold in the berries coated with flour. Spoon the batter into muffin tins. Now using a small spoon add some jam to the center of the tin & with the back side of the spoon swirl the batter in the muffin. Lastly sprinkle the streusel topping on the top of muffins & bake them for around 15-18 minutes(mine were done in 15 minutes). Enjoy these muffins when they are still hot or keep them in the fridge for next morning breakfast or late night snack, warm them in the microwave for about 15-20 seconds or enjoy it cold if you like it that way. wow wow wow.. looks beautiful and yumm. Lovely clicks....looks yum and rustic too...ANy road trips this weekend??? Wow!! These look and sound perfect to me!! Came here from your comment on my blog. I see you have a delicious space here. I love streusel topping and that muffin looks so good! Btw, I have replied to your query on whether I am from STL. Thanks everyone. @ Sushma, do give it a try when ever u get a chance, it's realy worth. LOOKS SO YUMMY AND FLUFFY! Been a while since i visisted your blog, Spice. I hope all is good. This looks like a delicious muffin and love the fact that it is eggless. You make them lood fabulous!